Kong: Skull Island gained attention from the viewing public not just for its tender treatment of an iconic monster, but for being packed with gaming Easter Eggs. Talk to director Jordan Vogt-Roberts and it all becomes clear: he's as dedicated as any of us. Such is his respect for games that when making Kong, he made sure people from the world of games played a key part in its production. 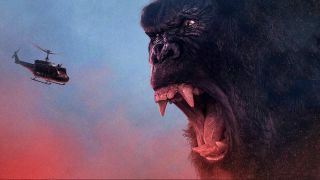 "On Kong, I very adamantly tried to only hire concept artists who had never done movies and really only worked in the video game world," he told us. "Just because I felt that it's fresh, and hopefully we were going to get more creativity out of it; less of a derivative feel from guys that have just been working on every movie over the last 20 years." One of those guys was Joseph Cross, a lead concept artist at Bungie who worked on Destiny. That connection also came in handy when Vogt-Roberts signed up to create a live-action trailer for Destiny 2. "We were actually able to do something very cool - Bungie had flown him out to me for a couple days," says Vogt-Roberts. "He was able to do concept art for me of how we translate [Destiny] to live-action, how we bring that to life and how we flesh out stuff that you might not even see in the game. So it really was a perfect and unexpected bridge that Kong beautifully set up." You can see the live-action trailer and read the full interview with Vogt-Roberts here.